This is what I call a great picture, just in the right place at the right time, and the best part ... WITH A CAMERA. You can't get a picture like this everyday. If that moose would be everyday in that spot practicing his sexual technique I'm sure that tourists would be very happy. 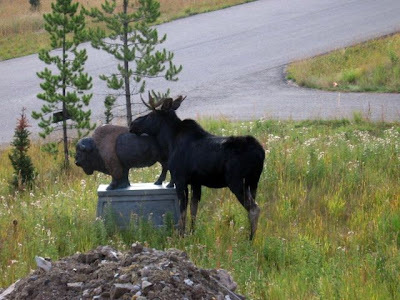 Finally I hope the buffalo statue will resist, because the moose is pretty big, and very horny.